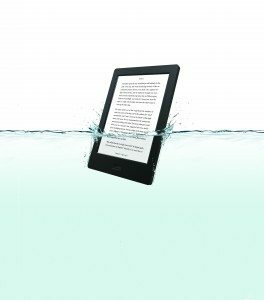 At Kobo’s pool-party event held last night in Toronto (complete with synchronized swimmers), the company made a splash with its announcement that it will be releasing a waterproof e-reader Oct. 1. The Kobo Aura H2O will include a high-resolution Carta E Ink display, 6.8” touchscreen, and anti-glare and front-light technology intended to make daylight reading easier on the eyes. With the port cover closed, the device will be waterproof for up to 30 minutes in water up to a metre deep, and the slimmer, “dust proof” design is meant to encourage beach reading. “When we asked our customers what held them back from reading more ebooks, many told us they love to read in the bath, by the pool, or on the beach, but believed that devices and water don’t mix,” said Kobo president and chief content officer Michael Tamblyn in a press release. The Aura H2O will retail for $179.99 in Canada. Water-baby readers eager to get their hands on the new e-reader can pre-order starting today at select retailers, or online at kobo.com beginning Sept. 1 in Canada, the U.S. and U.K.